We were contacted by Chewy.com who asked us to review some food. Really??? Sure - we are in. We picked the Divine Duos - we got the Chicken Pate and Diced Turkey. 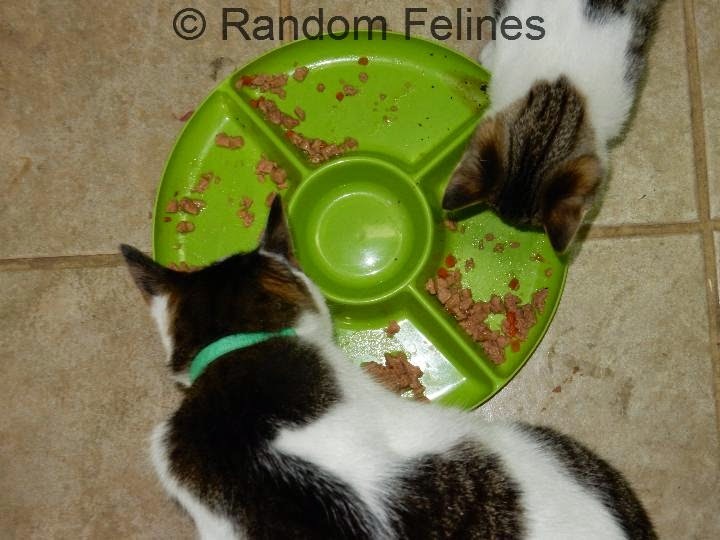 We got four containers, but mom was stingy and only opened 2 of them.....bah humbug to the mom. Anyhow, you can see that a certain foursome showed up right away. 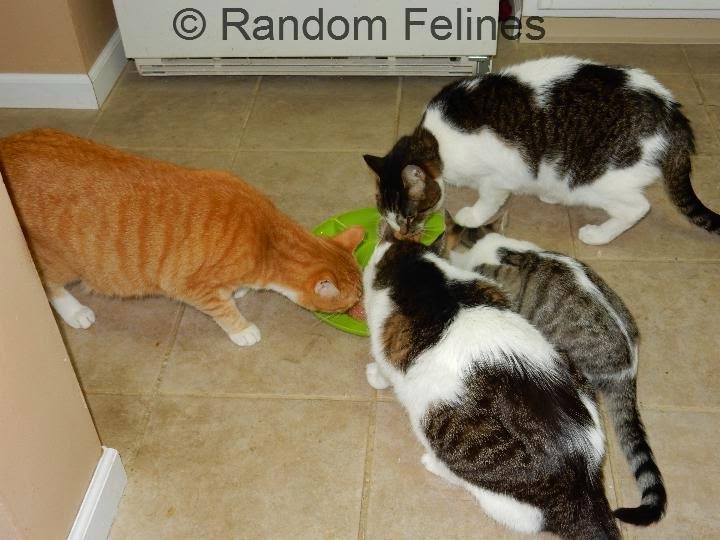 Open some food around here and those tabby boys are all over it - and they are teaching Daiquiri the same thing. Now, we have read a couple of reviews about this food on other blogs, so mom was interested to see what we would do. And, like we had read....the pate was a hit, the diced part not as much. As you can see from the last picture, there is a decent amount left. And carrots.....no thanks - we aren't into veggies. **while we we given the foodables, the opinions offered here are our own and were not influenced by the company. I love that dish and it looks like the food was a hit. WE don't like food with carrots and or peas in it That does look like yummy food. We have always liked the wellness foods. Have a wonderful day. Truffles felt the same way! Loved the pate but left the diced part behind. Oh, yum, veggies! I'll take those! The only reason carrots (and peas) get eaten around here is because we can't quite see what we're putting in our mouths! 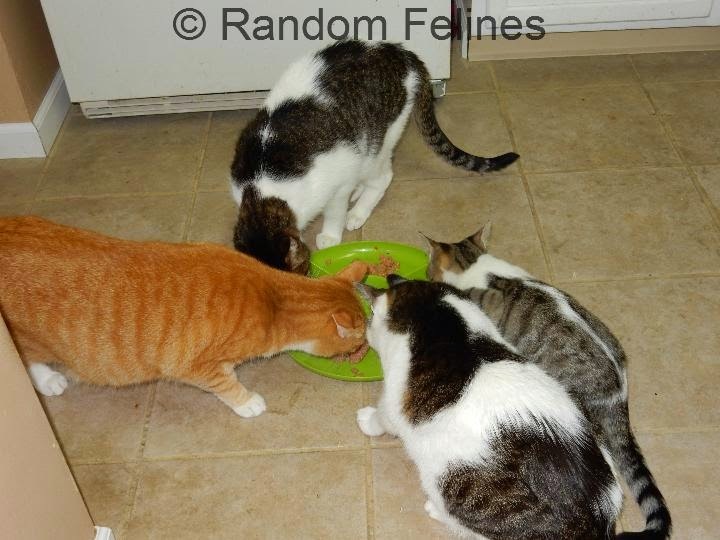 We really don't like them either and wonder why cat food companies keep insisting on putting them in there. I wouldn't mind if they added cantaloupe, though! Pierre had one of those tonight from our "novelty food" stash to keep him eating when he's not interested in his regular stuff. He left the carrots, too. But he at the rest, which was a big win. We tried these foods and felt the same way about the chunk part. Though we're not fond of any chunky foods, usually. We did like the pate part. We tried this food and will eat it, but it's not really our favorite. We tend to like the shredded food with lots of gravy in it. I'm surprised one of you didn't get eaten they you all went at it there.